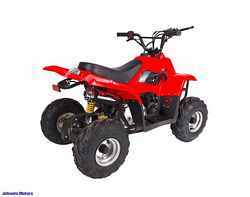 NOW WITH FRONT BRAKES & REAR FOOT BRAKE - THIS IS A KID ATVS 90 EXCLUSIVE & STANDARD SAFETY FEATURE!!! 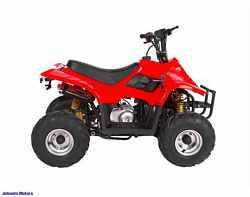 - The Kid ATVS 90 Full Auto Kids ATV is a great kids atv at a AWESOME price. 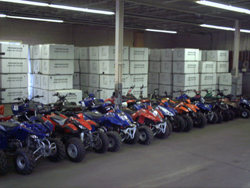 This machine is the smallest framed atv we sell & has a 4 stroke full auto Honda copied motor, that means no mixing of gas & oil for you. It has electric start, a rear hydraulic disk brake for fast stopping & front brakes as standard features. For safety features it has a tether cord & also a REMOTE KILL switch which gives the adult control of the machine by being able to kill the machine from up to 50 feet away. Like all the machines we sell it also has a throttle governor to limit the speed your little one can go, you can adjust the speed from 5mph up to wide open which is around 35mph. They have full independent front & mono shock rear suspension & for a mini atv it is very plush to soak up up the hardest terrain. Same great machine as the Kid Atvs 70, but a larger engine. Assembly is very easy, you only have to put on the 4 tires, attach & tighten the handlebars, attach the front bumper & skid plate & hook up the battery, it will take around 45 minutes to 1 hour to do this & your kid will be ready to ride. This is 1 very nice machine & the cost is unbeatable. This atv no longer comes with the fake headlight (lens only) as shown in the pics, it now comes with a handlebar mounted functioning head light, Look at the Kid Atvs 90R for the color Maroon & also the working headlight configuration now. You don't have to put the headlight on either, we just wanted you to be able to have the option of having a working light on your atv if you wanted to use it. We have many colors available also, see below for them all. WE HAVE FREE SHIPPING, the price you see right now is the price you pay delivered to your house.